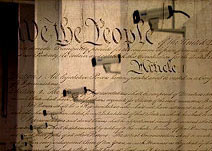 "The protections of the Fourth Amendment are clear. The right to protection from unlawful searches is an indivisible American value. Two hundred years of court decisions have stood in defense of this fundamental right. The state's interest in crime-fighting should never vitiate the citizens' Bill of Rights." -- John Ashcroft, Chairman of the Senate Commerce Committee on Consumer Affairs, Foreign Commerce and Tourism, 1997. Despite their clarity, the Fourth Amendment's protections against "unreasonable searches and seizures" have in fact been drastically weakened since they became the law of the land in 1791. As it stands today, unless there exists a "reasonable" expectation of privacy -- that is, a "reasonable" expectation that what one does or says will not be seen or heard by someone else -- neither local police nor federal law enforcement authorities are required to get a warrant or other court order before they start a surveillance operation. How does one establish whether, in a given instance, one's expectation of privacy is "reasonable"? The criteria are as follows: 1) general legal principles; 2) the vantage point from which the surveillance is carried out; 3) the degree of privacy afforded by certain buildings and/or places; and 4) the sophistication and invasiveness of the surveillance technology employed. 1. General legal principles. The expectation of privacy is not reasonable if the behaviors or communications in question were knowingly exposed to public view. Neither the simple desire for privacy, nor the fact that one took steps to obtain it, entitles one to reasonably expect it. For example, even if one set up roadblocks, hung "no trespassing" signs and moved one's house back into the woods, one might still be surveilled from the air without one's Fourth Amendment rights being violated. And yet, as the court stated in People v. Camacho (2000) 23 Cal.4 th 824, 835, "we cannot accept the proposition that [the] defendant forfeited the expectation his property would remain private simply because he did not erect an impregnable barrier to access." 2. Vantage point. The expectation of privacy is not reasonable if there exists a vantage point from which anyone, not just a police officer, can see or hear what was going on and if this vantage point is or should be known or "reasonably foreseen" by the person being surveilled. If such a vantage point exists in theory, the police can actually use another vantage point from which to conduct their surveillance, because what matters is the expectation of privacy, which becomes "unreasonable" if any vantage point exists (!). But the police cannot use a vantage point if they have no legal right to take or occupy it. The police cannot commit trespassing; they haven't if they have taken up a vantage point along a normal access route, an "open field," or a common area. 3. Certain buildings and/or pieces of land. The expectation of privacy is not reasonable at such public places as automobile thoroughfares (United States v. Knotts  460 US 276, 281), and national forests (United States v. McIver [9 th Cir. 1999] 186 F.3d 1119, 1125, but is reasonable at public phone booths (Katz v. the United States, 389 U.S. 347 ), rock concerts (Jacobsen v. Seattle, 658 P. 2d 653 [Wash. 1983]), and sports arenas (Collier v. Miller, 414 F. Supp. 1357 [S.D. Tex. 1976]). 4. Technological sophistication. It's easy to forget that, at the time the Fourth Amendment was written and adopted, the photographic camera had not yet been invented; it wasn't until 1826 that Daguerre patented the first photographic process. Because of the rapid development and increasing technological sophistication of televisual surveillance -- first, photography, then, close-circuit televison, and, finally, digital imagery -- "Judicial implementations of the Fourth Amendment need constant accommodation to the ever-intensifying technology of surveillance" (Dean v. Superior Court  35 Cal.App.3d 112, 116); "the Fourth Amendment must likewise grow in response" (United States v. Kim  415 F. Supp. 1252, 1257). This is especially true when it comes to "acquisition technology," that is, devices that, in effect, create vantage points that weren't previously there: audio bugs, wiretaps, and "video bugs" (covert wireless cameras), the use of which requires that the police must get warrants or other court orders.